Petunias are used as annual plants in most of the US and elsewhere although they are considered perennials in their native habitat of South America. These plants are possibly the most often used of annual summer bedding flowers. Their habit of spreading stems quickly fill an area and produce a dense mat of 'wall to wall' flowers. Petunias are also well suited to window boxes and other container type plantings where they can receive some shade during the hottest part of the day. 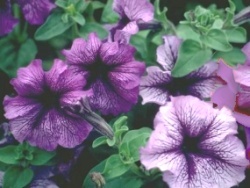 Among more recent developments are the trailing and climbing varieties of Petunias. Trailing petunias are ideal in hanging baskets or window boxes where they can reach lengths of up to 4 feet. You can use climbing petunias as a background screen to cover a fence or trellis. They can climb as high as 3 feet or more. Because of their fine seed and erratic germinating tendency, it is best to purchase plants for setting out. Flats and individual pots of petunias are available beginning in early spring. Pinch out the leading tip on young plants to encourage branching and many more flowers. Petunia stems and foliage are sticky and somewhat unpleasant to the touch. The color is medium green and covered in hairs. Flowers are funnel shaped and up to 3 inches across, sometimes ruffled or fringed. Plants can be single or double blossomed and come in just about every imaginable color and combination except true orange. Some yellow varieties have been developed lately, but they are not as prolific as some of the old standbys. You can easily increase your petunia collection by taking tip cuttings. They quickly produce new roots in water or moist seedling mix. Petunias are somewhat cold tolerant and can stand a bit of frost. On the other hand, prolonged heat, especially if planted in full sun, will cause them to pass on.